We recommend checking out our discussion threads on the Blackmagic Design HyperDeck Studio Pro 2 HYPERD/ST/PRO2, which address similar problems with connecting and setting up Solid State/HDD Recorders Blackmagic Design. 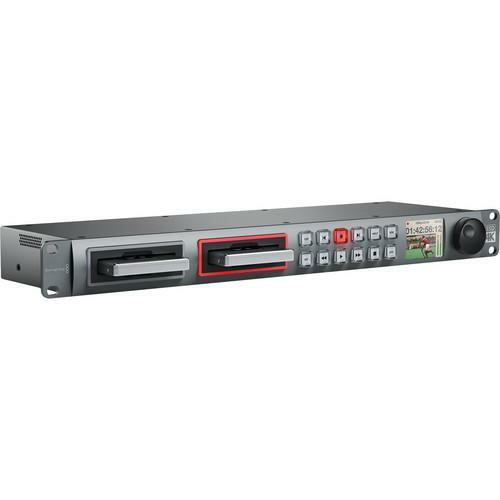 The user manual for the Blackmagic Design HyperDeck Studio Pro 2 HYPERD/ST/PRO2 provides necessary instructions for the proper use of the product Professional Video - Recorders & Duplication - Solid State/HDD Recorders. The Blackmagic Design HyperDeck Studio Pro 2 is a file-based deck that features the same functionality and control of professional tape decks. It records uncompressed video with 4:2:2 color sampling at 10-bit in .mov format, and also records video using either ProRes or DNxHD codecs. With two SSD slots, you can record almost endlessly as one SSD becomes full, recording automatically continues on to the other. The Studio Pro features one 6G-SDI input & output for 4K signals, and three SD/HD/3G-SDI inputs & outputs. It supports Ultra HD 4K via HDMI. It also features analog component in & out, with analog audio in & out, and timecode in & out. The Studio Pro 2 is a 1RU rack mountable unit, with built-in rack mount ears. It features illuminated front panel button control and a jog/shuttle wheel for analog scrubbing. RS-422 control is supported for external control. You can also control the unit using either the USB port or over ethernet via the RJ45 connector. An integrated LCD on the front panel allows you to monitor the video, and display timecode and transport information. The unit also incorporates a Thunderbolt port, for connecting the HyperDeck Studio Pro 2 to a computer. Box Dimensions (LxWxH) 19.2 x 7.4 x 2.4"
The user manual for the Blackmagic Design HyperDeck Studio Pro 2 HYPERD/ST/PRO2 can be downloaded in .pdf format if it did not come with your new solid state/hdd recorders, although the seller is required to supply one. It is also quite common that customers throw out the user manual with the box, or put the CD away somewhere and then can’t find it. That’s why we and other Blackmagic Design users keep a unique electronic library for Blackmagic Design solid state/hdd recorderss, where you can use our link to download the user manual for the Blackmagic Design HyperDeck Studio Pro 2 HYPERD/ST/PRO2. The user manual lists all of the functions of the Blackmagic Design HyperDeck Studio Pro 2 HYPERD/ST/PRO2, all the basic and advanced features and tells you how to use the solid state/hdd recorders. The manual also provides troubleshooting for common problems. Even greater detail is provided by the service manual, which is not typically shipped with the product, but which can often be downloaded from Blackmagic Design service. If you want to help expand our database, you can upload a link to this website to download a user manual or service manual, ideally in .pdf format. These pages are created by you – users of the Blackmagic Design HyperDeck Studio Pro 2 HYPERD/ST/PRO2. User manuals are also available on the Blackmagic Design website under Professional Video - Recorders & Duplication - Solid State/HDD Recorders.